Los Angeles - A rare 1852 handwritten letter signed by renowned abolitionist Harriet Beecher Stowe will be auctioned by Nate D. Sanders Auctions on January 31, 2019. The letter being auctioned is a response to a correspondence Stowe received from an unnamed man who sent her an article about slavery’s negative impact on the country. Stowe’s letter written while she was in Andover, Massachusetts is dated October 27, 1852 and reads in part, “…I am obliged to you for sending me the 'text to my subject' enclosed in your letter. It will be a very good one. Any one that stirs up this subject of southern law as a defence of slavery emphatically wakes up the wrong passenger. Nothing more is needed than to awaken the attention of the public to an expose of the slave law system. 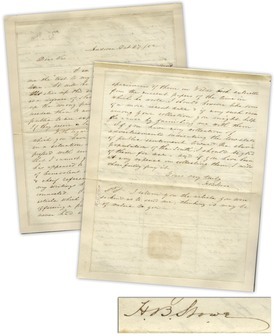 If they desire law on this subject, they shall have it…” The letter continues with a request from Stowe to send her other advertisements which would help her in her crusade against slavery. Bidding for the letter begins at $21,000.